I really like supporting my favourite artists by purchasing their apparel so today I’ll be posting about Omocat! Nothing like showing your love through merchandise lol /cough fandoms/. I first discovered her through Omori Boy and I’ve been a fan ever since. Her range of work covers fanart of games and anime/manga to her own character creations. I really like her style – she has that cute but gruesome style which I like lol, with vibrant and eye catching colours. I paid via paypal and shipping cost me US$14.00. It was packaged like generic clothing orders? In that plastic bag thing lol. 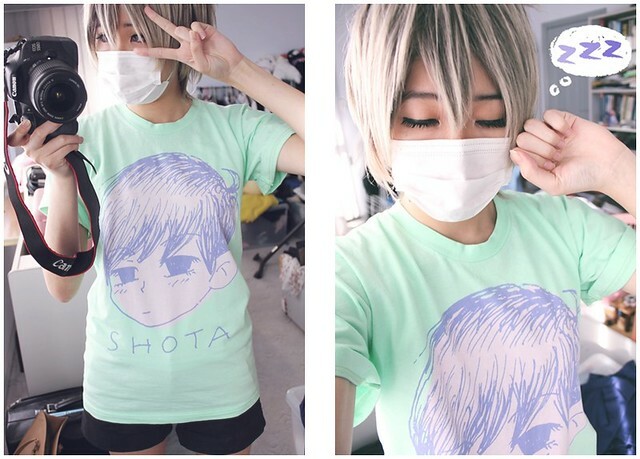 The SHOTABOY tee is from Omocat’s webcomic, Pretty Boy which is based the relationship two guys with seemingly different personalities. I think this is the first green top that I’ve bought and I like simple graphic tees which is why I chose it. There’s also a pink t-shirt from the series but I’m not really fond of pink clothing since I don’t think it really suits with what I’ve got in my wardrobe lol. This is great to wear during the warmer temperatures and the material isn’t too thin. It’s also a 100% cotton American Apparel tee so it’s super comfy! I like wearing baggy unisex t-shirts so I thought the fit was fine. I wish they sold the sweaters in XS as I prefer my clothing not to be too baggy, but otherwise it’s really warm and comfy to wear. I think I kinda look like a blob if I wear thicker clothing too baggy haha. The weather in Sydney doesn’t get too cold, so it’s fine to wear with a collar shirt underneath. 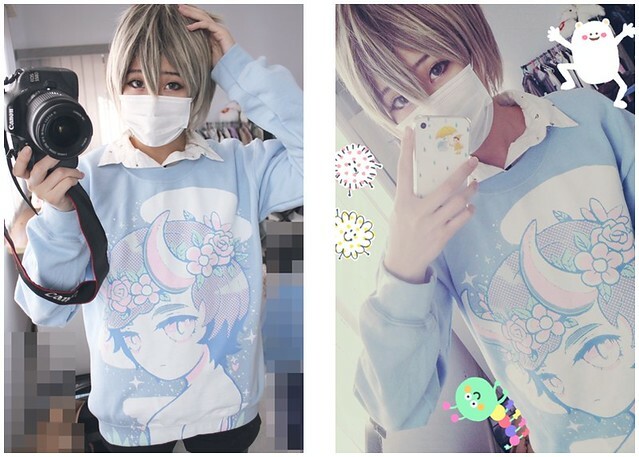 If you haven’t heard about Omocat before, please check out her blog, portfolio and store! And feel free to post any links in the comments to artists you follow online. I’m always interested to look at people’s artworks. I follow Omocat’s tumblr! I first ran into her works because of her Zelda fan arts 🙂 I’ve been thinking of ordering one of her fan art print sets! I also remember her because of those fanarts. Her webcomics of Link are so cute! Hello! If you mean the sweaters I think the print will last for a few years, I haven’t seen it start to come off yet. Love their product. But the worst buisness practices regarding processing time and shipping. 20 days in total to get something in the mail. I live in los angeles.